Recently, there are quite a number of investors mentioned about Tambun Indah online through blogs and forums for the past few weeks which really caught my attention. I decided to study about this company through the weekend. Tambun Indah is a propert developer with most of their land mark in Mainland Penang. There are many completed/ongoing projects mainly focus on residential properties. Tambun Indah listed on the main market in Jan 2011. 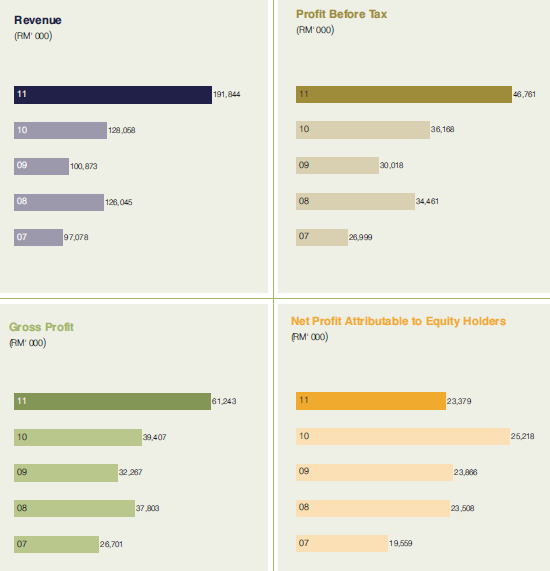 Tambun Indah group managed to record profits for the past 5 years albeit a lower revenue on year 2009, but overall it's still considered as a good fundamental company which recorded profits continuously for the past few years. As the group is only listed last year, not much historical data can be studied. The fact that Tambun Indah which started up in year 1993 and survived few financial crisis until today shows that the management team is doing really a good job to establish itself as a premier real estate and property developer. As at cumulative quarter Q312, Tambun recorded a 63% y-0-y increase in revenue and the diluted EPS for 9-months period is 11.30 cents. It should has no problem to get a full year 14 cents EPS for year 2012. Base on today price of RM0.76, its PE is only 5.4 which still has much more room to grow. Profit margin at the region of 18% and ROE at 20% which shows the management team control the cost of sales and utilise their earnings for expansion expenditure pretty well. As at balance sheet, debt/Cash ratio is less than 1 which majority of the borrowings are long-term loan. The current ratio is high at 3.80 which shows a good liquidity. 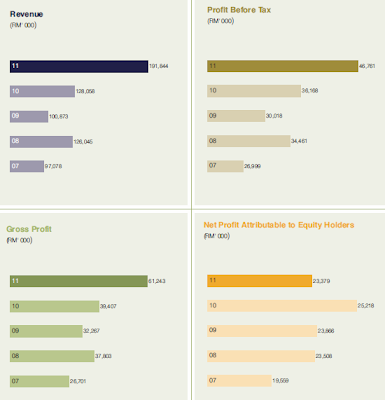 Retained profits are low, which is 1/3 of share capital. Thus, it's understandable that the group issued a right issue consisted of 2 right shares and 1 warrant for every 5 shares previously held to raise money. Tambun has a dividend policy of distributing 40-60% net profit as dividends. As a predicted full year EPS of 14 cents, it will distribute at least 5.6cents as dividends. Based on today price of 0.755, the dividend yield is 7.4% which is consider high. Tambun's portfolio is on mainland Penang which I personally think that the price of the residential property will just keep increasing due to the land scarcity there. The challenge for them is to get the land to develop and control the operation cost as well as the cost of sales. I have put Tambun in my monitoring list and it's one of the property stocks I would like to have beside Hua Yang and Mahsing. These three companies are just as good as they are in terms of fundamental. What I need now is to wait for the price to come down a bit so that I can own some as the price has gone up almost 20% thanks to the recommendation of 冷眼 during his talk. Perhaps the correction after the exercise date of its interim dividend at Jan 2013 will be a good time to purchase.